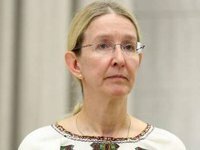 Acting Health Minister Ulana Suprun has said that by the end of the week the Ministry of Health will prepare documents to convene a special commission to consider the need to declare a measles epidemic in Ukraine. "The Ministry of Health has not announced an epidemic: there is now an outbreak of measles. We are now looking at indicators, whether it will proceed to the epidemic level," Suprun told reporters after a government meeting on Wednesday. According to her, in order to declare an epidemic, it is necessary to confirm a number of indicators, including not only the level of disease and mortality. Suprun also noted that a special commission takes the decision to declare an epidemic. "To declare an epidemic, we must convene a special commission that will do this. We'll collect all legal documents before the end of the week so that we can collect this commission and consider whether it's time to declare an epidemic," the acting minister added. According to Suprun, if an epidemic is announced, the ministry has more authority to purchase more vaccines, expanding the list of people who can receive the vaccine.